Who says you need words to tell a story? 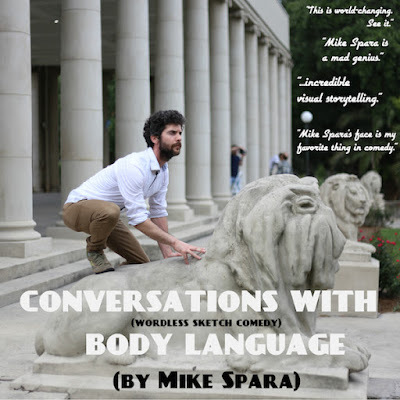 In Mike Spara's Conversations with Body Language, Spara offers an evening of solo wordless sketch comedy that pays homage to classic physical comedy by blending it with a upbeat soundtrack. Only Spara puts a modern twist on the night. Conversations with Body Language is essentially a series comedic snapshots that are filled with subtitles. Spara doesn't go for overt, laugh-out-loud jokes, allowing those little moments to shine. While they are present, it's the tiny humorous jabs that you truly appreciate. Spara's show has an eclectic array of stories to share. Highlights of the night include concocting and consuming a morning "smoothie" of a half dozen eggs and cottage cheese, a bubbling fool interrupting an orchestra playing a sappy Kings of Leon song, a karaoke routine where the video is interspersed with the presidents (and potential future presidents), and a love affair with a life-size Buzz Lightyear balloon. There are bits where Spara will attempt to interact with the audience, so be ready. You've been warned. With so many sketches jam-packed into an hour, Conversations with Body Language feels excessive. Spara is constantly forced to one up himself and when the next sketch doesn’t reach the height of the previous, it drains the momentum. Perhaps a reshuffling of scenes could alleviate the woes of flow. Though he should keep the “ottermission” interlude right where it is. Just wait until you see the video that accompanied it. It just might garner the biggest laughs. To honor the physical humor of the silent film age, Spara brings the title cards to the 21st century. Using projections to serve as the title cards, the use of technology helped to move the piece along. Spara, who also directed the piece, planned to have the music and projections perfectly timed. Sadly, they didn’t always sync up, causing some minor delays in projection-necessary skits. Mike Spara has a knack for giving it his all, even if his go-to audience participant didn’t quite react the way the scene called for. Nevertheless, what should be celebrated is the ingenuity and the subtle humor Spara offered. Conversations with Body Language is just a night of fn.